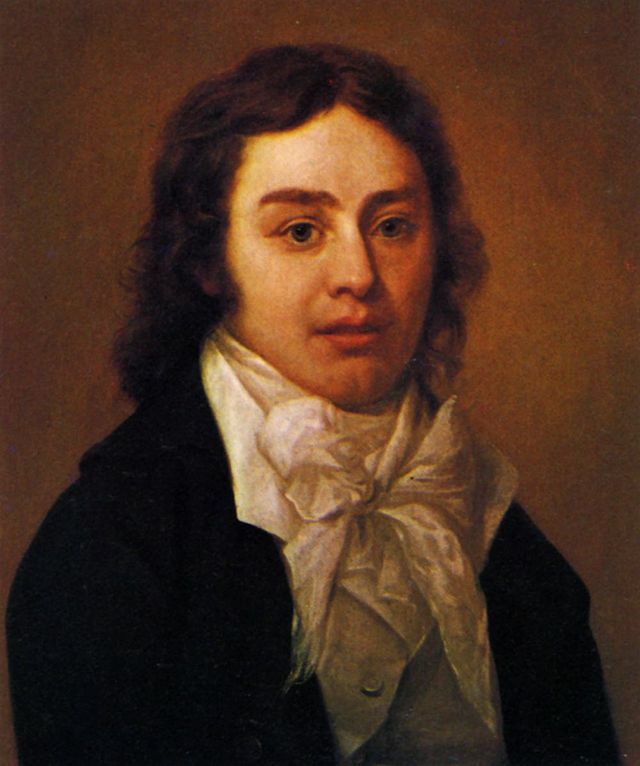 Samuel Taylor Coleridge was arguably one of the greatest poets in the English language, as well as having a profound influence on the literary criticism and philosophy of the following generations. He’s mostly associated with Devon, London, Cambridge, Somerset and Cumbria, but he also spent a brief period living in Hertford. Coleridge was born in 1772 in Ottery St Mary, Devon, the son of a clergyman who died when Coleridge was nine. He was an immensely intelligent and imaginative child and a voracious reader, and his uncle gained him a place at Christ’s Hospital School, often referred to as the Bluecoats School. At length the time came, and I donned the blue coat and yellow stockings, and was sent down to Hertford, a town twenty miles from London, where there are about 300 of the younger Blue-coat boys. At Hertford I was very happy on the whole, for I had plenty to eat and drink, and we had pudding and vegetables almost every day. I remained there six weeks, and then was drafted up to the great school in London, where I arrived in September 1782, and was placed in the second ward, then called Jefferies’ Ward, and in the Under Grammar School. Although there are many accounts of Coleridge at the London school, this appears to be the only description of his time at Hertford. Coleridge went from Christ’s Hospital to Cambridge, although he never gained a degree, and subsequently lived a troubled, turbulent life as a poet and critic. The period of his friendship and collaboration with Wordsworth produced some of the greatest poems of the Romantic era – The Rime of the Ancient Mariner, Christabel, Kubla Khan, Frost at Midnight and Dejection – while it was under his influence that Wordsworth produced much of his best poetry, including The Prelude, whose working title was Poem to Coleridge. He later concentrated more on literary criticism and philosophy, both his Biographia Literaria and even more his conversation among gatherings of London’s intelligentsia having a profound effect on the generations that followed. Coleridge is well known for being addicted to the opiate laudanum. This wasn’t entirely his fault, though. It had originally been prescribed to him as medication, as it frequently was then, since he’d been left in bad health by childhood rheumatic fever. At the time, the effects of opium addiction weren’t understood, and Coleridge interpreted many of the symptoms as depression and anxiety. By the time he understood the need to “detox”, the damage had already been done. The last years of Coleridge’s life were spent in London, dazzling everyone who met him with the profoundness of his conversation, but he wrote little poetry of worth after he was about 35. He died in 1834. Although his connection with Hertford was short and probably had little effect on his development, the town can be proud of briefly fostering one of the great geniuses of English literature. This page was added on 12/11/2014.